Carrie, I've been feeling the loss here so I can only imagine what all of you at New Day are going through. You and the rest of the staff have been in my prayers since I first heard the news, and I will continue to lift all of you up in prayer. No apology necessary…I just want him to be remembered, too! My heart has been aching since the day I got the news from Karen, so I know it must be a gazillion times harder for all of you who knew him personally. We are and will continue praying for all of you at NewDay. I know everyone is hurting right now, and still a bit in shock. No one seen this coming, which makes it even more surreal. That sweet baby will surely be loved and missed by MANY… both near and far are feeling his void already. Praying for God's grace to comfort and sustain all of you during this difficult time. Praying with and for you all. I am so sorry. May you and all who knew him find comfort and peace in Him. My heart just aches for you all. Please know that you as well as all the New Day staff are in our prayers. I am so sorry for your loss. I will pray for little Tristan and everyone at New Day. I'm very sorry for your loss. How blessed you are to have known him and share in his life. How blessed he is to be with his Heavenly Father and for his memory to live on through you and the ND staff. Thank you for sharing so we can also pause to remember him. Words really just don't seem enough right now but I will pray and God will take care of the rest. My only comfort is knowing that he is at home with one that loves him more than we can imagine. I will be in prayer for all of the staff. oh NO!!!!!!!!!! Sweet sweet boy. How I long for the return of my Savior. I know we will see that sweet boy again. 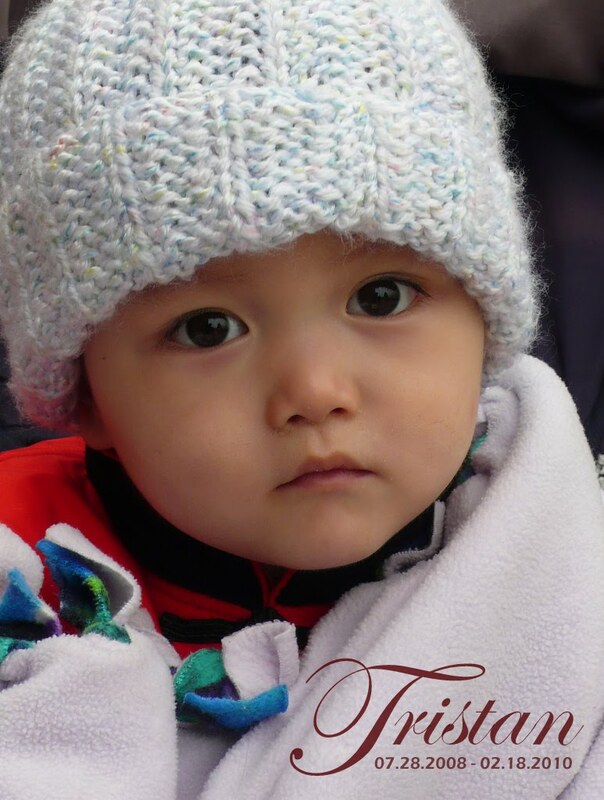 My heart too, breaks for the loss of Tristan, but rejoice in that he is not an orphan anymore. Am praying for God's love and comfort for all of you there, especially the ones that need to know Him. How incredibly heartbreaking. I will remember him! I loved watching him grow in your pictures. I am praying for you all as you grieve. Thank you for the ways that you held him, loved him, laughed with him and cherished him. thank you for being Jesus to him. Tristan knew love because of you and the New Day staff. I pray you all touch the lives of many more darling little faces that need it so. My heart just sank when I saw your post. So, so sorry to hear about Tristan. Praying for peace and comfort for all of you during this time of loss. I am so sorry for the loss of this beautiful little boy. So sad. I know your hearts are heavy. Praying for God's peace. He is now in the arms of Jesus… no more tears, no more sorrow… I am so thankful that for the short time he was here he found himself in the arms of people who genuinely love him. Thank you to all those at New Day for being his family here on earth. For telling him how precious he is. For making a difference in his life. praying of all of you. Heart breaking. I'm so glad that you found us! My own little Tiger is my heart boy. I understand how special these little heart boys are! In the process of Kai's heart surgeries, I had a nurse tell me that she would never try to save one of these kids with very serious heart problems. She sees these kinds of kids every day. And she said that she can't trust these hearts, even when repaired. At that moment, I was more determined than ever to fight for life. Just as you do, everyday. sweet boy, in the arms of Jesus. what a beautiful child. This must be so difficult for everyone there. So sorry. How sad!!! I am very sorry for your loss!!! The only comfort I can find in this sadness is that he is now in the loving arms of Jesus!!!! I am so sorry to hear of your grief~it's sickening that you lost your loved one especially in a world where so many parents could care less! I am so sorry. The news was so hard to hear. I'm so glad that he was loved at your foster home and knew God's presence there.